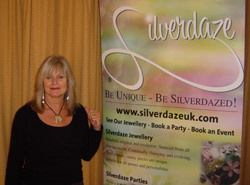 Silverdaze jewellery parties are informal, always fun and a great success, so you can enjoy having a get together, trying on our stunning jewellery and seeking the advice and opinions of your friends and family! On the evening we will arrive 45 minutes before your guests arrive to set up and display our beautiful jewellery. We will be there for around two hours so your guests feel free to come and go as they please. We provide you in advance with colour invitation cards to send to your friends, family and colleagues. At the party we are there to offer help and advice should it be required - there is NO hard selling involved and NO obligation to buy. All that's required of you is the provision of an average size dining table or equivalent space and a power point. At the end of the party your guests pay for their purchases by cash, credit card or debit card and are able to take their chosen jewellery home with them individually wrapped in a lovely embroidered Silverdaze bag! Have a fun night to remember and jewellery to the value of 10% of sales! Surprise your colleagues with a sparkling Silverdaze sale at your workplace and we will donate 10% of our sales to your corporate fund or chosen charity! Earn money for your schools, churches, social clubs and charities! We donate a raffle prize and 10% of all our sales to your particular cause!